Oh you facebook loyalists will love this one. After defriending a ‘friend’ on facebook, a woman from Des Moines, Jennifer Harris, woke up to find her garage in flames. Thankfully her and her husband woke up in time and were able to escape the fire unscathed. Apparently the arson attack was the result of a fight Jennifer was having with a friend of hers in regards to a party that was being planned and all this was playing out via Facebook – because the real world is far too real apparently. In order to put an end to the fight, Jennifer decided to defriend her friend, Nikki - oh no she didn't! Apparently this didn’t sit too well with Nikki who decided that the best form of retaliation for such an affront was arson. Yeah, that seems perfectly rational. Lesson number one for all of you out there reading this: pick up the damn phone. Facebook is not the real world, nor should we conduct ourselves solely through these channels. Lesson number two: if you’re defriended on Facebook, put down the matches. It’s not the end of the world; in fact, you probably have a handful of friends of Facebook that you should defriend anyway cause they’re probably not your friends in the first place. This of course is something I always think about when I scroll through my ‘friends’ on FB. My first thought is, who the hell are these people? I kid…and yet, I don’t. It’s astonishing we are all comfortable with the fact – or pretend to be – that we amass friends like lint on sites like these, when let’s be honest, most of the names in our friends stable are people we haven’t spoken to in twenty years and were never more than acquaintances – if that. In fact, I'm often being asked to be friends with people I've never even met. Hmmm, me thinks it's time we go back to the textbook definition of friendship, just for the fun of it. For those of you that are mortally offended by my honesty, simmer down, you know I’m right and you are just aching to do a mass culling of your Facebook friend-stable so that you actually recognize some of your so-called friends. But of course you haven’t, and you won’t. 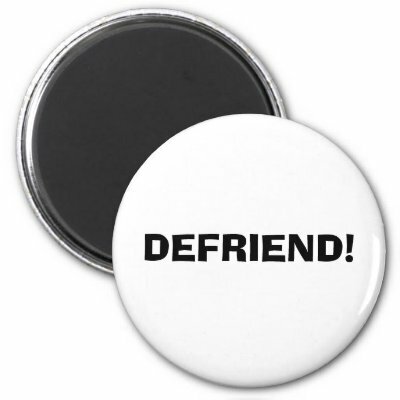 Cause in the realm of Facebook, for some reason, no matter how rational the ‘defriend’ option is in some situations, it is one of those cyber taboos that people just can’t seem to handle. In real life – i.e. not in the perverted reality of the cyber world - if Nikki and Jenny were having a squabble over a party, they would give each other the cold shoulder for a few weeks, not return some phone calls and then patch things up over a nice hot latte. Then again, from the sounds of it, I’m thinking Nikki may want to stay away from the caffeine right about now. Maybe a nice cup of chamomile tea will do the trick.